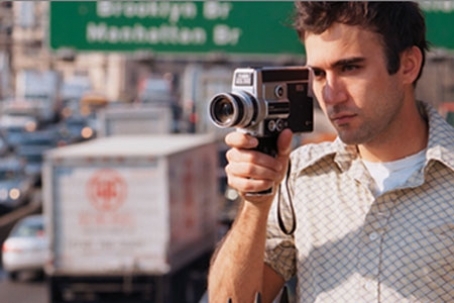 In 2007, Sufjan Stevens added yet another tag to his résumé as musician, composer, lyricist, poet, writer, and overall-creative-soul: filmmaker. His short film, entitled The BQE, is a self-described “visual travelogue” of New York City’s poorly planned stretch of outer-borough highway and its surrounding neighborhoods, shot in 16 mm and Super 8. The film first premiered at BAM in November 2007, with Stevens performing the accompanying score, which he composed, live; now, two years later, he is releasing the DVD version on October 20th (Asthmatic Kitty) . What is the musical piece exactly? Not so easy to say. In an era that unravels musical forms, The BQE suffers an identity crisis. It is inspired by the programmatic symphonies of the Impressionists, but it aspires to the pageantry of Copland and the melodrama of a John Williams movie score. It could be a suite, a fugue, a theme and variation, a repetition of melodies, a canon, to name a few. The film is equally genre-bending. Part video montage, part documentary, part videogame (Frogger came to mind more than once), The BQE is a sensory smorgasbord that challenges most notions of filmmaking, or, if the score is more where your attention lies, music video-making. And like the majority of Stevens’ artistic endeavors, the film is infused it with its own unique brand of kitschy-Americana, this time in the form of three scantily-clad hula-hoopers.